As your child grows, they develop a greater need for freedom and a more experimental nature. A bike may be a great way to help your child explore. However, children between the ages of two and five often haven’t developed the balance needed to use a traditional bike properly. Balance bikes offer a good middle ground. Rather than pedals, they rely on your child’s legs to work. This helps them develop coordination and balance, in addition to leg strength. Balance bikes also lower the risk of injury and can build your child’s confidence. They’re light, and offer the opportunity for you to bond with your child over a shared activity as you teach them how to ride. However, they also offer ample opportunities for individual play as your child becomes comfortable with their bike. A good balance bike must be sturdy and stable, while also being light enough for your child to move it around easily. I’ve spoken to several parents about their experiences with balance bikes. Below, you’ll find my take on eight of the best balance bikes available on today’s market. 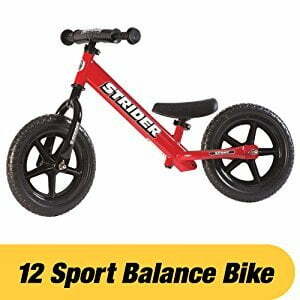 Available for ages 18 months to five years, the Strider bike has chunky wheels. This gives it a larger base, making it easier for your child to balance while riding. They’re also puncture-proof, so they can handle uneven surfaces and the occasional rock or other obstacles without any issues. The adjustable seat and handlebars are a great feature. The bike can grow alongside your child, so you can start them early and build their confidence over several years before moving them onto a pedal bike. Better yet, you don’t need any tools to adjust them either. The padded seat makes it soft on young bottoms, and offers the rider some more control. The handlebars also offer plenty of grip, so little hands won’t slip at inopportune moments. There’s also space for your child to rest their feet on the side of the bike. As your child learns how to balance, they’ll use these footrests to glide along on the bike. They can also easily transition from cruising while using the footrests, to using their feet to slow the bike down. Despite having a steel frame, the bike only weighs 6.7 pounds. Children should have no problems moving it from place to place, or turning it while they ride. You also have a choice of colors, including black, blue, pink, and red. It isn’t perfect though. The handlebars are a little stiff, which younger kids may struggle with. The tires are also some sort of plastic and foam combination, rather than rubber. The Cruzee bike earns its UltraLite moniker, weighing in at just 4.4 pounds. Young children won’t have any problems steering or carrying the bike. The low weight, coupled with its small size, also make it very portable. You have a choice of 19 colors for the bike, so you can find something that suits your child’s preferences. You get the standard colors, such as blue, black, and white. However, Cruzee also offers purple and silver, in addition to various wheel and frame color combinations. Made using anodized aluminum, the frame shouldn’t experience any issues with rust. As a result, your child can take it out in the rain without worrying about damaging their bike. 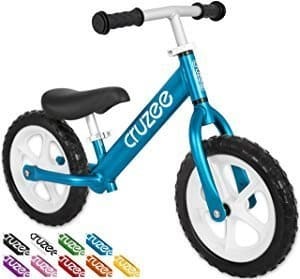 It’s also a sturdy bike, which Cruzee reinforces by offering a lifetime warranty. I also appreciate the use of foam rubber for the tires, which lends them durability while mirroring the tires of a push bike more closely. The handlebars have soft grips, and the seat offers plenty of padding. Cruzee has also filed down the nuts and bolts, so there’s less chance of your child’s foot getting caught on them. The bike also comes with two additional seat posts, so you can replace the default one as your child grows. This offers the bike a seat height range between 11.5 inches and 20 inches. The bike also carries Consumer Product Safety Improvement Act (CPSIA) certification. The only real negative comes when you have the seat at its lowest setting. It’s a long seat, and it comes into contact with the frame when at its lowest. Available for children aged three to four, the Chicco takes a slightly more simplistic approach. It doesn’t have any footrests, but the seat is thick and soft, and the rubber handlebars offer plenty of grip. You can also adjust the height of the seat, though the handlebars stay stationary. The handlebars stand at 22 inches high, while the seat’s lowest setting is 13 inches. You can move the seat up to a maximum of 15 inches. The puncture resistant tires are sturdy, and the bike weighs less than seven pounds when removed from its packaging. The metal frame can also carry a weight up to 55 pounds, offering longevity and sturdiness. Again, I’d prefer rubber tires over the plastic you get with this bike. However, the plastic tires do offer sturdiness. Unfortunately, if you do dent them, it’s difficult to get them back into the proper shape again. You’ll also notice some fairly hefty screws sticking out from the rear wheels. Your child may bash their feet against them at first, though a little riding experience usually solves that problem. I love the look of the Street Bike, as the frame makes it stand out from many others. It’s chunky, has a sporty little number emblazoned on the side, and sneakily houses the saddle adjustment knob. All you have to do is unscrew the knob, adjust the saddle height, and screw it back in. The brake is also a nice touch. Located in front of the right handlebar, the brake brings the bike to a safe stop without your child having to use their feet. It’s especially useful if your child hits a high cruising speed, and it opens up the opportunity for safe downhill riding. The curved seat offers lower back support, but it’s a bit thin for my taste. It does make it harder to slip off the bike though, so it’s safer for inexperienced riders. I also like the shock-absorbent frame. 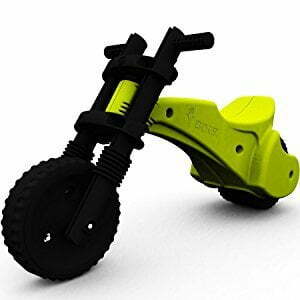 This allows your child to tackle rougher surfaces, as the bike absorbs most bumps that might otherwise jolt the rider. Available for two to five-year-olds, the bike also features inflatable tires. While this does make punctures a possibility, it also makes the riding experience feel more like a push bike. As a result, the bike may be a good choice for children who are almost ready to make the switch. I did notice another small issue with the backseat. The little upward curve at the back can make it more difficult for smaller children to mount the bike. The issue remedies itself as your child grows, but it’s inconvenient when buying the bike for a short child. The first thing you’ll notice about this bike is the unique look. Instead of mimicking a push bike, this bike looks more like a mini motorcycle. It has wide wheels, which offer greater stability, as well as a chunky plastic frame. I was a bit wary of the plastic frame at first, as I didn’t think it would be as rugged as metal. However, the plastic can handle hard impacts, though it may come away with a small dent or two. Closer inspection of the bike’s rear reveals a pair of wheels. This is more of a tricycle than a push bike, though the design doesn’t match that of the traditional tricycle. Instead, the two rear wheels are bunched closer together to add stability. It’s not the lightest bike, as it weighs in at 11 pounds. 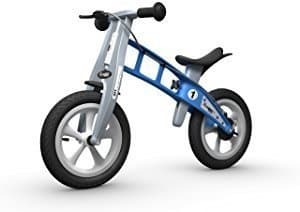 While this again adds to the sturdy feel, it can make the bike harder to play with for younger children. It differs when compared to some of the other bikes in this area, as a few of the bikes on this list weigh half of what this does. An adjustable saddle would have really added to this bike. The seat is molded into the frame and stands 10 inches above the ground. As a result, it’s not suitable for taller children who will find it difficult to push the bike forward while remaining seated. ​The wide frame does emphasis the YBIKE’s safety focus. However, it can also make it difficult for your child to ride if they have shorter legs. The winner of several awards, the Wishbone bike’s best feature is its customizability. It comes with three settings, including a tricycle, balance bike, and large balance bike. As a result, it has a longevity that other bikes don’t have, plus it can adapt to your child’s balancing abilities. The wooden frame also makes it stand out. Made out of a combination of sustainably-sourced eucalyptus and birch, the frame can withstand most bumps. However, it is still wood, so really heavy impacts could cause the frame to split. I also like Wishbone’s use of non-toxic finishes and glues throughout. The wheels are thick enough to provide stability, plus they’re made of 60% recycled plastics. Furthermore, the recycled packaging emphasizes the bike’s all-natural approach. It’s a slightly heavier bike, weighing in at over 13 pounds. This may make it difficult for toddlers to carry, so I recommend assisted play until your child’s muscles develop. It also has a very thin wooden saddle with very little padding. The bike also has a wide turning radius. While this isn’t a problem at low speeds, it can cause issues when your child cruises. It’s best not to use the bike in enclosed spaces or on tight cycle paths. 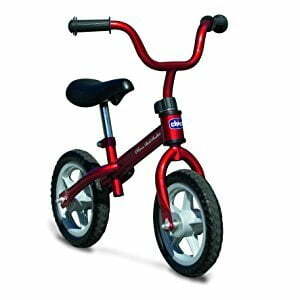 Ideal for younger children, this bike looks nothing like the balance bikes you may have seen before. It features four small caster wheels which the frame spreads out wide enough to offer plenty of stability. It also has a large seat in the center, which may make it one of the most comfortable balance bikes around. This is as much a walking trainer as it is a balance bike. 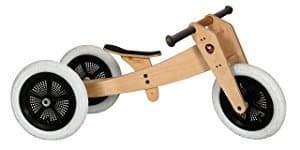 As a result, it may be a good choice for toddlers who are just starting to walk around, but don’t have the balance and coordination for a traditional balance bike yet. It features an aluminum frame, which protects it from rusting. It’s lightweight too, as it weighs only 4.4 pounds. The castor wheels also offer full 360 degree movement, so your child uses their legs to change direction instead of handlebars. The large front wheel offers plenty of space for your child to grab, plus it has large holes for fingers. The molded plastic seat has plenty of padding, which makes it comfortable. Of course, the bike doesn’t mimic traditional push bikes. As a result, it may not be the best choice to help your child make the transition from balance bikes to a normal bike. The castor wheels also struggle on carpet and may rotate too quickly on smooth wooden surfaces. It also requires tools for assembly, which don’t come with the bike. Think of this as a more advanced version of a walker with many of the attributes of a balance bike. Available in three colors, the banana bike has received several improvements in recent years. Banana Bikes have made the bike simpler to assemble, improved the seat, and have used better bearings in the most recent version of the bike. The curved frame provides more space around the saddle, so there’s less chance of your child catching their legs on the bike as they mount it. The saddle is also adjustable, reaching a minimum height of 12.2 inches and a maximum of 15.75 inches. It also has enough padding to keep kids comfortable as they ride. Like some of the other bikes on my list, this one has foam EVA tires. While this means it feels slightly different to a traditional push bike, you also don’t have to worry about punctures. The tires also don’t need inflating before the bike can be used. Available in three colors, the bike has a sturdy metal frame. However, it’s lightweight enough for a toddler to lift it easily. Furthermore, it’s small enough to slot into the trunk of a car, so portability isn’t a problem. The stickers, which spell out the word “banana”, have a habit of peeling off after extended use, which ruins the bike’s aesthetic. The seat attachment isn’t the strongest either. I think there’s a chance it could break if the bike falls, or if your child falls off it awkwardly while riding. Without stability, a balance bike can’t help your child’s coordination and balance develop. You’re looking for a sturdy frame that can withstand the occasional drop, a rigid and comfortable saddle, and tightness in the wheels. At the toddler stage, your child also develops some individual preferences. In particular, he or she may already have a favorite color. 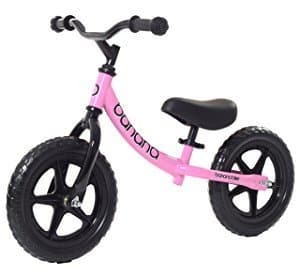 Getting a balance bike in this color may increase your child’s affinity for the bike. I’ve listed some of the main features that I think all balance bikes should have. In an ideal world, your child will spend many hours riding their balance bike. According to the Centers for Disease Control and Prevention (CDC), children should get an hour of exercise every day. However, an uncomfortable saddle will prevent this. Bad saddles feel harsh on young bottoms and may cause pain with extended use. Ideally, the saddle should have enough padding to make it comfortable, without restricting your child’s movement. If your child rides a bike that’s too large or small for them, they’ll struggle to balance. They also become more susceptible to saddle sores, as a poor riding position creates more friction in sensitive areas. An adjustable saddle also offers the bike longevity. It can grow with your child, until they’re ready to move onto a pedal-powered push bike. Adjustable handlebars are a bonus, but not essential. You need to strike a balance with the frame. 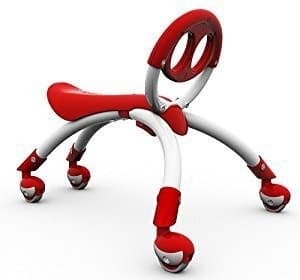 On one hand, it must be sturdy enough to withstand small drops, especially if your child rides on hard surfaces. However, the bike must also be light enough for your child to handle it easily. While the bikes on my list use several materials for their frames, I have a slight preference for aluminum. It keeps the bike’s weight down, can take a beating, and has the added benefit of being rust-proof. Strong tires that can handle several types of surface without puncturing. Nothing on the frame or wheels that may obstruct your child’s movement. A strong frame that can withstand bumps and drops. A choice of colors or designs to encourage your child’s sense of individuality. Width in the base and tires to improve stability. A balance bike may be the ideal transitional toy for parents who want to teach their children how to ride. They emulate push bikes closely, but don’t place as many physical demands on your child. Instead of having to take their feet off the ground to ride, children push themselves along and cruise when they’re comfortable. A good balance bike develops basic dexterity, balance, and coordination. It will also build leg and arm muscles, preparing your child for a regular bike. My list highlights what I think are eight of the best balance bikes available in 2018. Each has something unique to offer the rider, but it’s up to you to make a choice. 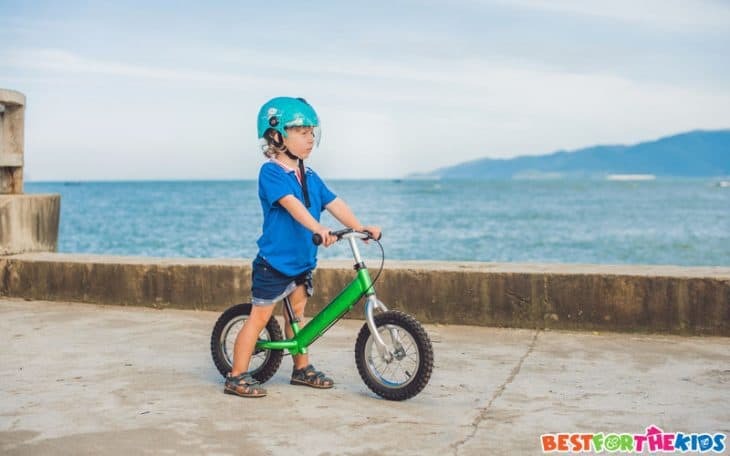 Use the information I’ve provided to find a balance bike that will help your child get to the next stage of bicycle riding.